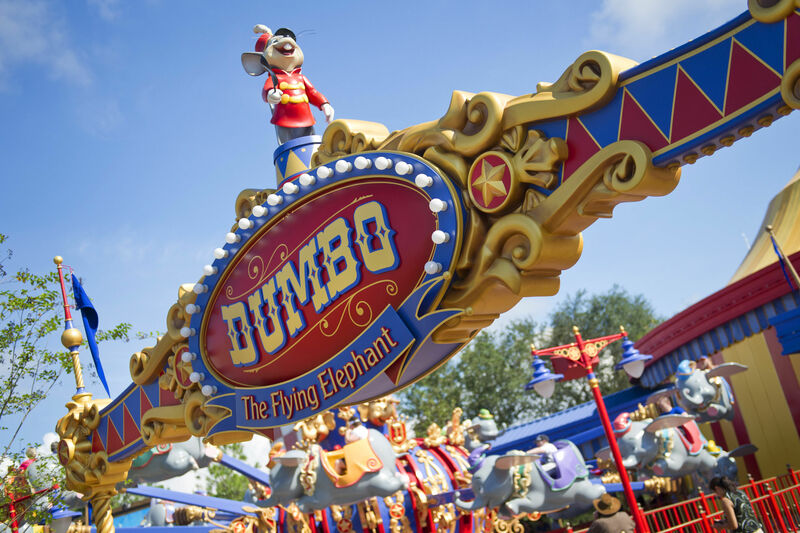 The famous Dumbo ride at New Fantasyland, Walt Disney World's Magic Kingdom. 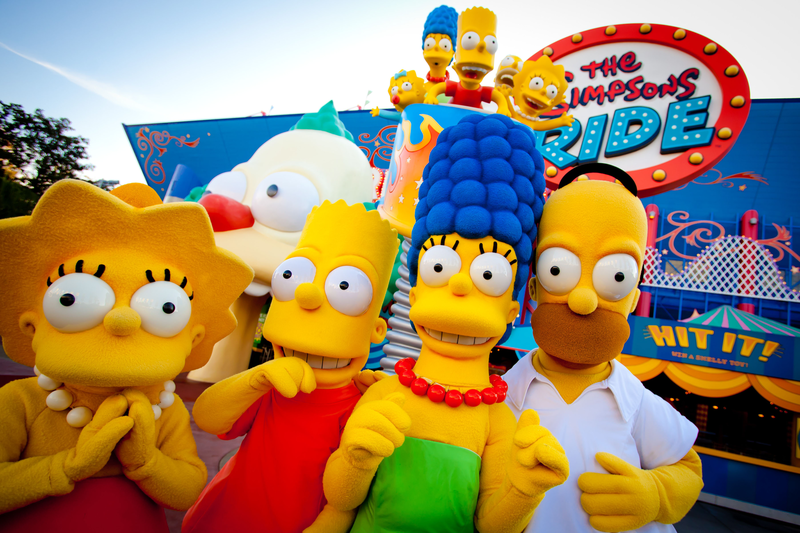 The wacky Simpsons Ride at Universal Orlando is fun for all ages. 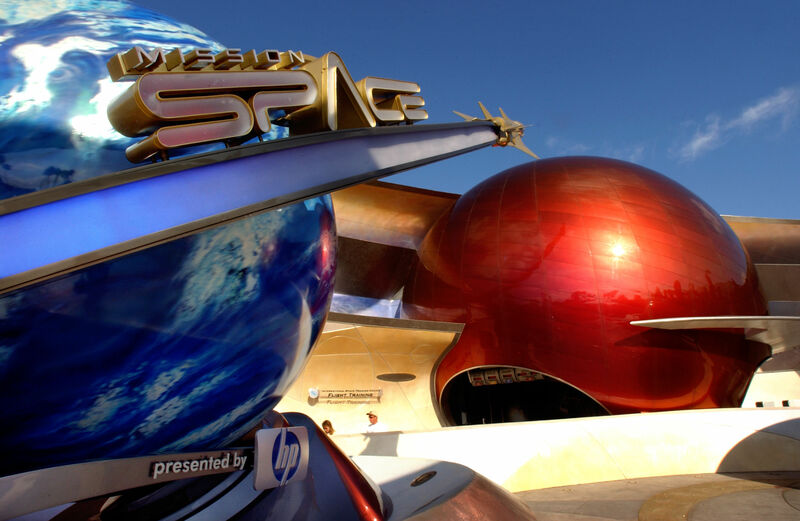 Mission Space is only one part of the future-forward EPCOT park. 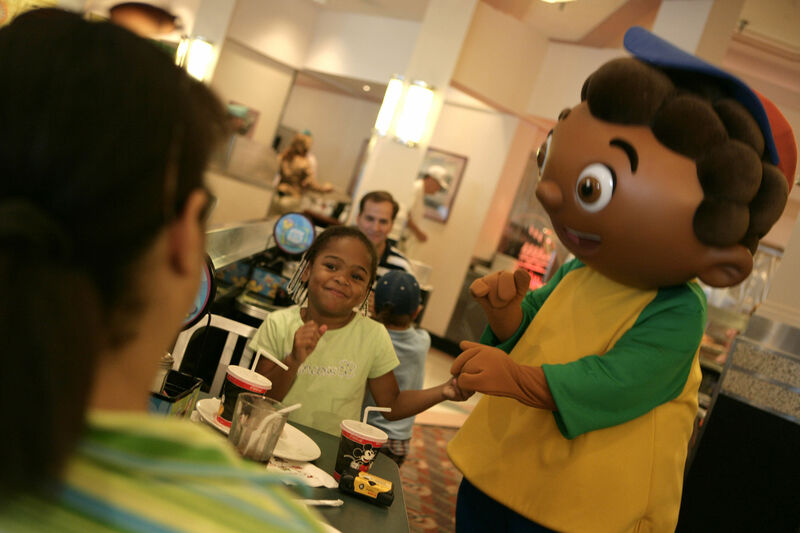 Character dining is a big part of the experience at all the parks. 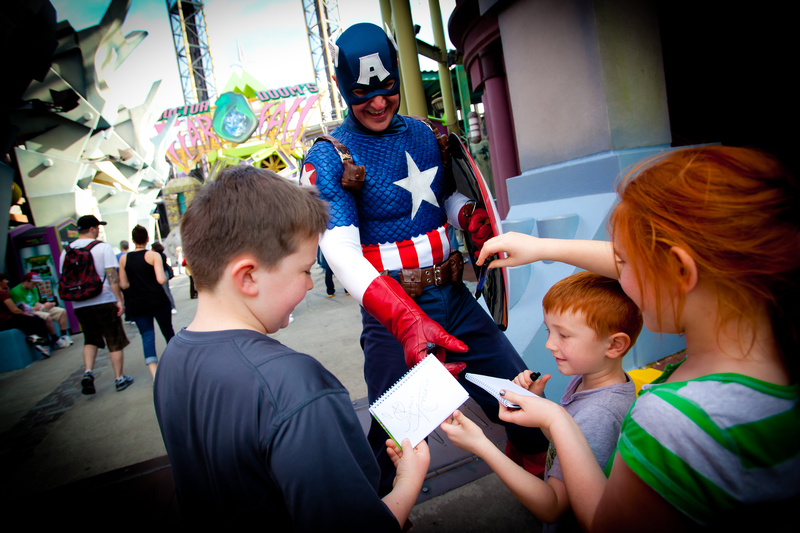 Meet and greet your superheroes at the Orlando themeparks. 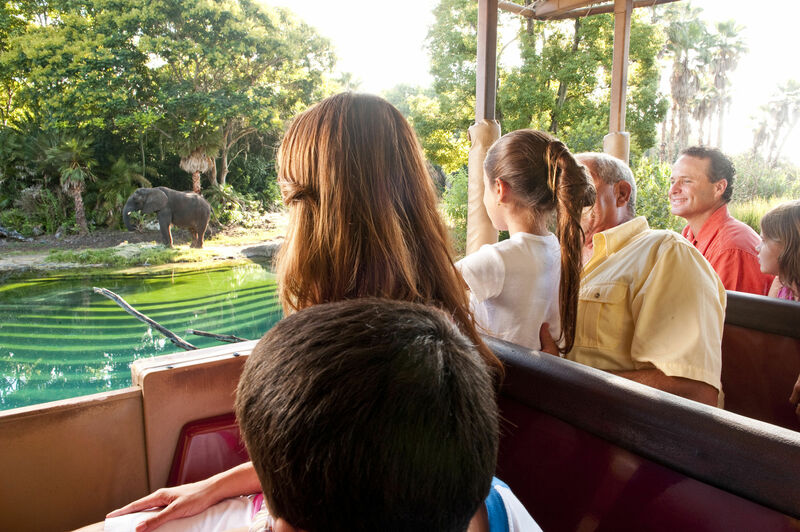 At Animal Kingdom, Safari Trek is part ride, part educational tour. Planning a theme park vacation in Orlando can be overwhelming because so many of the newest attractions come from movies, video games or other familiar media, that each family member may clamor for a different ride or show. We suggest you research the best bets at both Walt Disney World and Universal Orlando for younger kids, older kids, and the family together (grandparent-safe) with this guide; in the process, you’ll discover the best of what the top theme parks have to offer and how to plan your days. Remember, things are always changing, too. Keep in mind that both themeparks have Rider Switch policies that allow an adult to ride, while another adult watches kids who may be too small or grandparents who may be too timid. When the ride is over, the guardians switch places so the other can board the ride from the head of the line. We all know that everyone, from grandparents to college spring breakers, loves Disney World, but let’s face it — the Magic Kingdom is the stuff of dreams for the park’s youngest visitors. A chance to meet beloved characters alone could make the trip, which is why a stop at Mickey’s Toontown Fair is imperative. Here, just in case you didn’t bump into them around the park, your kids can meet famous Disney characters in the Toontown Hall of Fame before exploring Mickey and Minnie’s country houses, Donald’s boat, or Goofy’s cute Barnstormer kiddie coaster. If your kids are into royalty, the Princesses Fairytale Hall is a must-stop so that they can easily collect autographs from several princesses at once. New Fantasyland is another area for little ones, with classic rides like It’s a Small World and Dumbo the Flying Elephant, the classic interactive Enchanted Tales with Belle show, and the gentle Seven Dwarfs Mine Train coaster. Tom Sawyer Island in Frontierland involves a steamboat ride to an interactive playground. Mickey’s Philharmagic is a special show for this age group. And of course, just walking around the Magic Kingdom with your kids will reveal more surprises and little gasps of joy. Traditionally, Epcot isn’t the strongest park on activities especially for very young children, but there are some fun attractions that will entertain little ones while older family members get their cultural fix. The most exciting is Turtle Talk with Crush, an interactive attraction that features the sea turtle from “Finding Nemo” chatting with his visitors. Journey into Imagination, starring Figment the purple dragon, is another sensory experience — dark but not scary — appropriate for young children. There are 11 Kidcot crafts stations where parents and little ones can take a break and flex their creative muscles. Disney’s Hollywood Studios is the place for great cinema-based entertainment and, with so many Disney and Pixar films becoming kids’ classics, you know your family can spend an entire day here. Perhaps most popular is “For the First Time in Forever: A Frozen Sing-Along Celebration” — yes! — a live show featuring Elsa, Anna and friends from the hit film “Frozen” doing the score and thrilling kids and fans of all ages. The 30-minute show is almost every hour on the hour; book those seats via FastPass. Those who love the spinning ride Toy Story Mania will be pleased to hear that it will be expanding into a new, immersive Toy Story Land; opening date not announced yet. Disney’s Hollywood Studios also features shows based on some of television’s most beloved puppet characters. Jim Henson’s Muppet*Vision 3D creates a tour through Muppet Labs with 3-D film and animatronic appearances. Heirs to Star Wars fandom will be interested in Star Wars Jedi Training: Trials of the Temple, firsthand tips from a master Jedi that won’t be scary if older sibs are doing it. Few things capture children’s imaginations more than dinosaurs. Children too young to go on the DINOSAUR ride (40″ requirement) can head instead for Animal Kingdom’s The Boneyard, an area where budding paleontologists can play at digging up dinosaur and ancient mammal skeleton fossils. Discovery island Trails is the place for Tarzan and animal interaction zones with interactive learning stations. The TriceraTop Spin creates a prehistoric version of the Dumbo ride, while the Wildlife Express Train (most of the park’s other trains are currently closed for renovation) will appeal to young conductors who want to steer their train to the animal care areas of Animal Kingdom. Favorite cartoon stars from different generations, but with “universal” appeal, can be found at meet n’ greets around Universal Studios. Live shows include one with animal actors and another with that big purple animal, Barney, both designed to keep preschoolers enthralled while parents get a 20-minute respite. The best bet for the littlest of tykes at Universal is Woody Woodpecker’s Nuthouse Coaster, which offers a pint-sized thrill. E.T. Adventure is a family classic that lets you ride a bike up into the air to transport E.T. to his home planet. From “An American Tail,” Fievel’s Playland is a mouse-eye view of life, with a lot of climbing structures in an interactive playground. Although the attractions of Islands of Adventure are marketed for “serious” thrills (as if those at the original Universal Studios park weren’t enough), they also contain plenty of rides and attractions for little ones. The entire island of Seuss Landing is a great place to start and to meet some of the world’s most beloved literary characters. This island includes the non-height-restricted Cat in the Hat ride (which is themed to Grinchmas over the holidays), the Caro-Seuss-el with Suess creatures instead of horses, the One Fish, Two Fish, Red Fish, Blue Fish water play ride, and an interactive playground area. Don’t miss the new High in the Sky Seuss Trolley Train Ride whose colorful cars ride rails overhead. Over on Jurassic Park Island, the Jurassic Park Discovery Center offers games and educational displays, while Camp Jurassic is yet another themed playground to take the kids to while your teens brave facing T-Rex. Which Pirates of the Caribbean came first, the movies or the ride? Disney “old-timers” know the answer: the ride. The swashbuckling animatronics have been entertaining visitors for years, but it wasn’t until recently that the movies turned back around to influence the ride. Now, Captain Jack Sparrow and other new special effects add to the adventurous atmosphere of the ride. The big thrills of Big Thunder Mountain, Space Mountain and Splash Mountain, the legendary rattling train, the dark, indoor roller coaster and log flume ride, also demonstrate the irony that some of the hippest rides for older kids in the Magic Kingdom are also some of the old mainstays. Get your Fastpasses ready. The best attractions for older kids at Epcot transcend our everyday experiences of speed and perspective. Mission: SPACE is a technologically awesome flight simulator that puts participants in the driver’s seat of their NASA fantasies. Kids who are hesitant to try it can choose between a more sedate or a more rigorous version of the ride as they advance through the line. Test Track recreates another high-speed, but very much on-the-ground and interactive situation: automobile testing. Guests design their own vehicle at kiosks in the pavilion, and save them to a smart card. After the “test” ride in which six passengers and their car designs face hill climbing, harsh road surfaces, skid recovery, high speed, and bracing curves; designs are scored and evaluated for performance. The ride, designed in partnership with General Motors Engineering, is meant to be educational about automotive technology and safety. If you prefer to relax in Italy while the kids continue their fun, sign them up for Phineas & Ferb: Agent P’s World Showcase Adventure, an interactive, moving video game where smart cards and wonderful computer animation is used to make “walls” come to life and share clues to foil the evil Dr. Doofenshmirtz. If we had to pick just one Disney ride that older kids rave about, jump up and down for, and want to go on again and again, it would have to be MGM’s Twilight Zone Tower of Terror. After a short pre-show that evokes the old television series, visitors board and ride an “old” elevator to the top of the tower, only to have the elevator cables “snap” and cause a freefall of several stories. At one point, the doors even open slightly to show you how fast you’re falling. A simple concept, really, but the drop sequences are not always the same and the atmosphere is fun and creepy at the same time, inspiring repeat visits. The Rock n Roller Coaster Starring Aerosmith which bundles you up in a celebrity limo also doesn’t disappoint, with its unexpected drops, sudden high speed, and blaring Aerosmith soundtrack. But the newest thing to rock Hollywood Studios is the expansion of the “Star Wars” franchise. Before Star Wars Land opens (date unannounced), stormtroopers can storm over to the immersive 3D Star Tours – The Adventures Continue ride, the fun Star Wars Launch Bay where ST newbies can learn some history, and watch “Star Wars: Path of the Jedi” before enrolling in Jedi Training: Trials of the Temple among other extraterrestrial attractions. Kali River Rapids is Animal Kingdom’s answer to the whitewater rafting ride. Go on a hot day, and prepare to get soaked. The DINOSAUR ride offers thrills of a different kind — there’s a T-Rex on the loose in this ride, and he’s anything but fossilized. For us, the most exciting attraction in Animal Kingdom is Expedition Everest, a journey to the base camp of the mountain to end all mountains. Along the way, visitors depart from a recreated Himalayan village on a roller coaster with many surprises. Those who don’t know what a yeti is will soon find out. Whatever you decide to do in any of the four Disney parks, don’t forget that the emerging Disney Springs is a fun family hang-out, especially in the afternoon and evening. The neon and sushi Splitsville bowling alley has revitalized the commercial zone formerly known as Downtown Disney by attracting rainy day themepark-avoiders and aftershool partiers to what is essentially a raucous, themed shopping mall. For bowlers, it’s a splurge, but it’s cheaper and just as fun as a day at the parks. Don’t miss the linens, kitchen supplies and princess outfits at the largest Disney merchandise shop in the world. Feel at ease letting the kids walk around on their own. Whether they attend the Cirque Du Soleil show “La Nouba” with the rest of the family or head off to devour the popular and well-priced burgers at T-Rex, tweens and teens will feel like this is one of the happening places to be. Of course, Universal Orlando’s CityWalk is another fun teen hang-out, but then again, many of the major attractions throughout Universal are best suited to older kids who want to “ride the movies.” Revenge of the Mummy plummets riders through the mummy’s tomb and creates a psychological thrill with ghouls galore. The Men in Black Alien Attack allows you to play the MIB agent by zapping aliens and possibly saving the planet Earth. Terminator 2 features a combination of 3-D film, live action stunts, and special effects. Skill Island, the Reign of King Kong is set to open during the summer of 2016 and, if it’s anything like the King Kong 4D ride in Hollywood, it will be awesome. The wild Transformers: The Ride 3-D puts ‘astronauts’ in the middle of an intergalactic battle where they join Optimus Prime and the Autobots to save mankind, wow. The latest expansion to the blockbuster wizardly world is Wizarding World of Harry Potter: Diagon Alley at Universal Studios; this amazing recreation of London’s back streets is accessible by a themed Hogwarts Express train connecting it to the original themed WWHOP at Islands of Adventure. The Amazing Adventures of Spider-Man is one of the most popular rides at Islands of Adventure, and this revamped “3D” Spidey’s eye view attraction is a big hit with older kids that love the hip superhero series. Thrill seekers should continue on to the Incredible Hulk Coaster and Dr. Doom’s Fearfall. There’s an entire Jurassic Park island with a thrilling river raft adventure, starring T-Rex and velociraptors, as its centerpiece, plus the more gentle Pteranodon Flyers ride. The Wizarding World of Harry Potter, perhaps the most crowded themed island, features the Quidditch-themed racing coaster pair known as Dueling Dragons as well as remarkable theming in the village of Hogsmeade and the Hogwarts school. The New Fantasyland is packed with charming rides like a reimagined Dumbo the Elephant and the very entertaining Enchanted Tales with Belle show. Even though your littlest ones will be given the chance to wear costumes and “help” Belle, the whole family will be entranced by the computerized animatronics at work in Lumiere the Candlestick and other props and characters from “Beauty and the Beast.” It may be a little creepy, but the Magic Kingdom’s Haunted Mansion is really designed with all ages in mind — most of the ghosts are quite good-natured, after all. Buzz Lightyear’s Space Ranger Spin tends to bring out the competitive streak in just about anyone (in a fun way, of course), while whatever parade or nighttime spectacular is running at the time of your visit will be a must-see. More good old-fashioned, educational attractions like the Hall of Presidents and the Carousel of Progress provide a quick history lesson break during a busy day at the park. Take a relaxing, classic Jungle Cruise or play together at Sorcerers of the Magic Kingdom, an interactive role playing game where guests use “magic cards” to activate hidden images and get clues to continue their fight against evil. The Magic Kingdom’s “Celebrate the Magic” show, in which images of favorite Disney characters are projected on the castle walls and in the air, is a don’t miss evening event. Just stroll around Epcot’s World Showcase where family members can “shop” destinations for their next big trip, whether it’s in China, Canada, Norway, Mexico, France, Japan, or the USA. Music, dance, interactive activities, movies, rides, displays, and interesting food and drink are scattered throughout the colorful pavilions devoted to different countries of the world. Among rides, the IMAX style Soarin that floats over California’s most beautiful terrain is a family favorite; there are several in the Futureworld section. The Kinsey Collection of arts, artifacts and documents related to African American history is on view at the American Heritage Gallery. By the way, if you’re thinking of eating dinner at one of Epcot’s international restaurants, make reservations early in the day. And be sure to stick around afterwards so you can catch IllumiNations, the fireworks show that enlivens Epcot’s central lagoon. The Great Movie Ride is a classic, just like the Hollywood films that it travels through, but keep in mind that the scene from “Alien” may be too scary for very little ones. This is a signature ride and a dream-come-true for movie buffs of any age. Hollywood Studios is also home to the Beauty and the Beast stage show, which you might want to hit if you never got to see the Broadway production. At the core of Animal Kingdom are the Kilimanjaro Safaris, which take passengers on a Jeep-like ride through herds of real African animals, including lions, elephants, hippos, giraffes and in a refresh-the-excitement move in 2012, a new herd of plains zebras. Animal Kingdom is also home to the Festival of the Lion King, an in-the-round stage show with song, dance, and audience participation in its tribal celebration and the universally acclaimed “Finding Nemo” musical show. Just wait till Avatar comes to this park (they’re promising some time in 2017); many other innovations are bound to follow. The great Despicable Me Minion Mayhem combines 3D technology, the film’s animated little yellow creatures, and a cute storyline into a very funny ride. And of course, The Simpsons Ride, which brings to life the iconic Springfield that TV show fans have grown to love, is the kind of humor that all ages appreciate at their own level. Shrek 4-D picks up where the first Shrek movie left off, on Shrek and Fiona’s honeymoon, and involves the film’s original cast and creative team. For a classic family movie ride experience, try the E.T. Adventure, which offers a journey to the mild-mannered alien’s planet on flying bicycles. The Blues Brothers show has great music, multi-age appeal and lots of entertainment value. The popular Superstar Parade and nighttime show, Universal’s Cinematic Spectacular celebrating the studio’s centennial are both worth seeing. Remember Popeye the Sailor Man and his girlfriend Olive Oyl? You’ll find rides and restaurants themed after these characters on the Toon Lagoon island, where visitors are sure to get splashed, one way or another. Littler kids will enjoy playing on Popeye’s ship, while the family can try out Popeye and Bluto’s Bilge-Rat Barges (whitewater rafting ride) or Dudley Do-Right’s Ripsaw Falls (log flume ride). If you’re with kids of a literary age, do not miss the Wizarding World of Harry Potter, where you can admire Hogsmeade, drink Butterbeer and visit Ollivander’s Wand Shop if anyone’s too young for the fantastic rides. Don’t miss the newest addition, a recreation of Diagon Alley connected to this park by a Hogwarts Express train departing from Platform 9 3/4. For more information on the latest attractions, age restrictions for rides mentioned, and family themepark vacation specials, visit the Walt Disney World Resort website or call 407/939-6244; or visit the site of Universal Orlando Resort or call their reservation agents at 407/224-4233.